Nairobi city skyline view from Nairobi National Park. Standing in line to check in for my flight to Nairobi, I saw a man I recently met at a good friends wedding. He said hello and we started to chat and discovered we were both on the same flight to Nairobi. He was going to Dubai so he’d have to transfer. Having been to Kenya many times in the past, he shared his love and dislike about the country. This was my first trip there so you can imagine I was eager to hear his view. “They have an amazing nightlife and love to party until dawn,” he said. “Yeah, I’ve heard that about Kenyans. They party stronger than Ghanaians,” I responded. The next thing he proceeded to say shocked me, especially because the reason I was travelling to Kenya was for a food show I am working on. “Kenyan food is horrible,” he proclaimed. “It’s so bland and has absolutely no flavour.” he continued. I couldn’t believe what I was hearing. So I asked him why he felt so strongly and he explained that their food has no taste because it lacks pepper. His statement is one I typically hear Ghanaians make when talking about food that lacks pepper. You see, Ghanaian dishes have a tendency to not only be spicy, but actually very hot. Sometimes flaming hot. So I understood why he would come to the conclusion that Kenyan food was bland. Swahili Coconut Fish Curry with rice and kachumbari was my first dinner in Nairobi at Java. Despite what he said, I was still really looking forward to trying the food for myself and forming my own opinion. After all, I have an appreciation for different types of cuisine and I don’t think all food needs pepper. My first real meal was at a popular restaurant/cafe called Java. Most of the menu featured foreign style dishes and cafe basics like pastries and coffee. 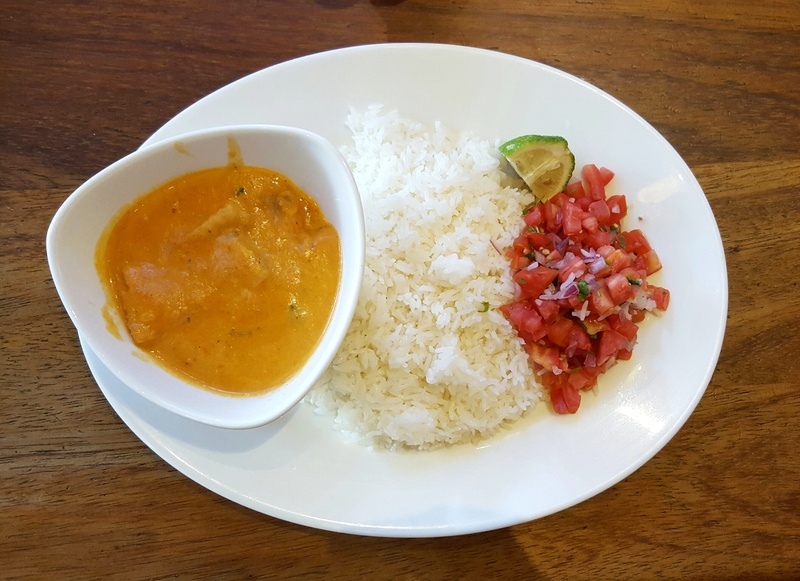 I ordered one of the few local dishes featured; Swahili Coconut Fish Curry with steamed rice and kachumbari (a tomato side dish that looks like salsa). It was the perfect introduction to Kenyan cuisine. The flavour was an example of how Indian food has had a lasting influence in Kenya. 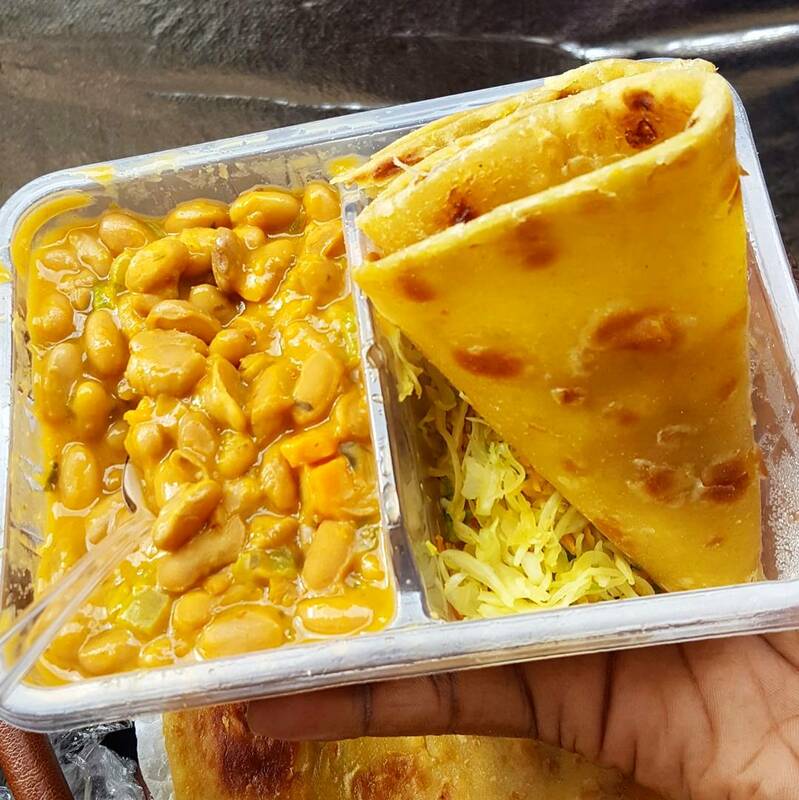 One of their most popular foods is Chapati. Many say it’s truly Kenyan, when it’s actually Indian. Kenyans eat it at all times of day; with tea for breakfast or as an accompaniment to another dish for lunch and dinner. I absolutely loved eating in Kenya. I found their food to be delicious and quite healthy. The meals are not cooked using too much oil and I find they use leafy greens and beans to make some great dishes. One of the most popular foods is Ugali, which many refer to as a staple dish made using maize, It’s usually paired with Nyama Choma (grilled meat). When I tried Ugali amd Nyama Choma for the first time, I felt like I had a burst of delicious flavour. It was an instant moment of happiness. 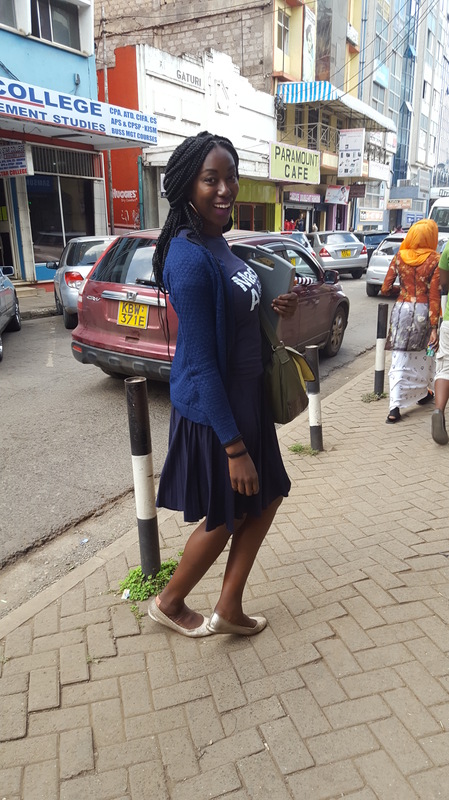 Walking in Nairobi’s city centre in between production locations. The city itself is a vibrant urban centre that proves the continent of Africa is more than the negative images often shown in western media. 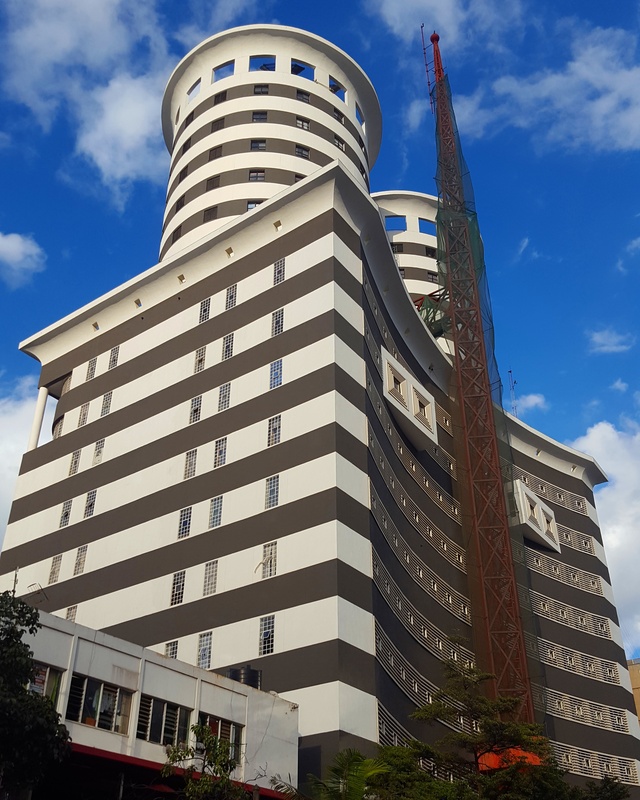 Despite the city being overshadowed by tragic events like the terrorist bombing of Westgate Shopping Mall in 2013, it really is a gem in Eastern Africa. 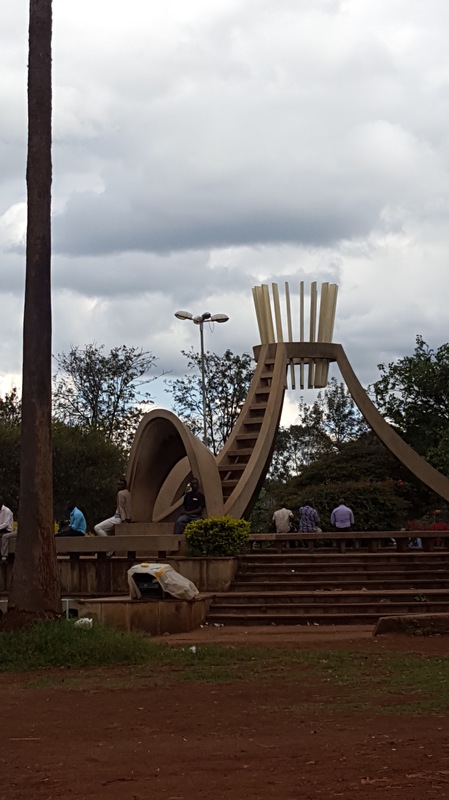 Walking through the city centre, known as the ‘CBD’ (Central Business District), I felt the energy and a sense of passion and purpose in the people. It had a true urban, cultural, metropolitan vibe that was much more than I expected. There were some corners that even reminded me of being in New York City. Some of the architecture clearly shows the mark of colonialism. Similar to styles I’ve seen in many countries once occupied by the British. All this is blended with newer modern buildings that reflect the future and vision of a modern Africa. My biggest admiration of this city was the way they co-exist with nature and have created a balance that allows for an appreciation of the environment. When we think of big cities it usually conjures up images of a ‘concrete jungle’. 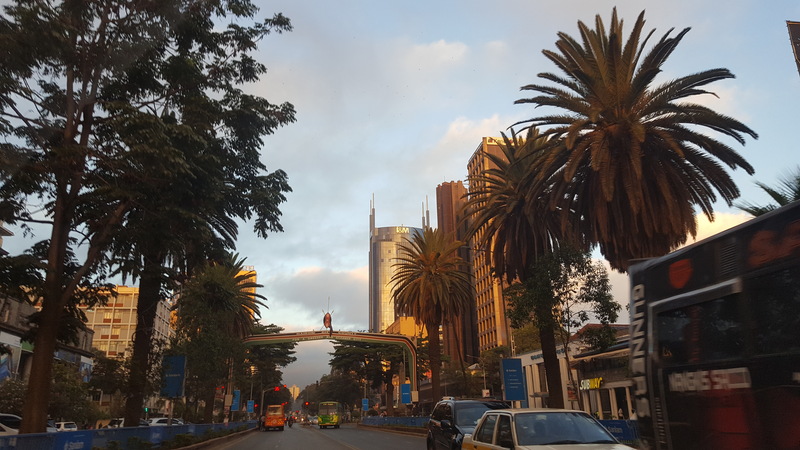 Although Nairobi has its fair share of buildings throughout the city core, they have also created a dynamic ecosystem where many trees are planted amongst the concrete structures. 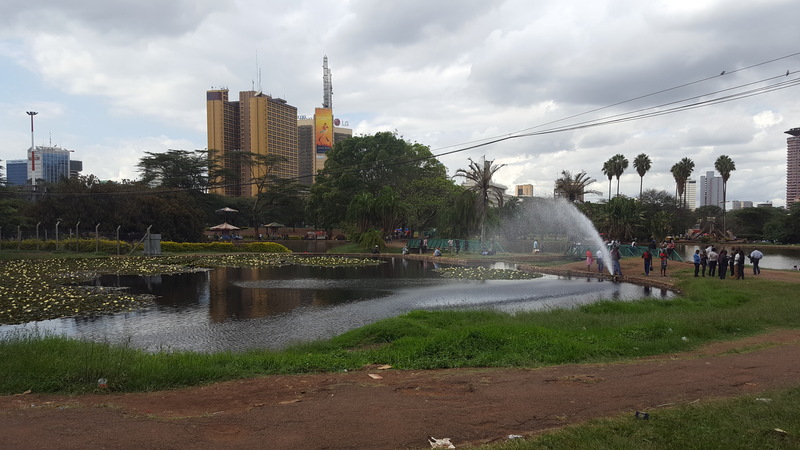 I strolled through Uhuru Park which has so many plants, trees and a small lake where people were paddling through the water. Many office workers were relaxing on their lunch break, eating and just taking in a little piece of nature. A large reason why Kenya has had much of its natural environment preserved is because of the efforts of the late Wangari Maathi, who was an environmental activist. She won the Nobel Prize for Peace in 2004 for her contributions to sustainable developement and environmental protectionism. It’s because of her that tens of millions of trees were planted and forests were protected in Kenya. As a result, the people have embraced the concept of respecting your environment. There was also a sense of responsibility when it comes to garbage. 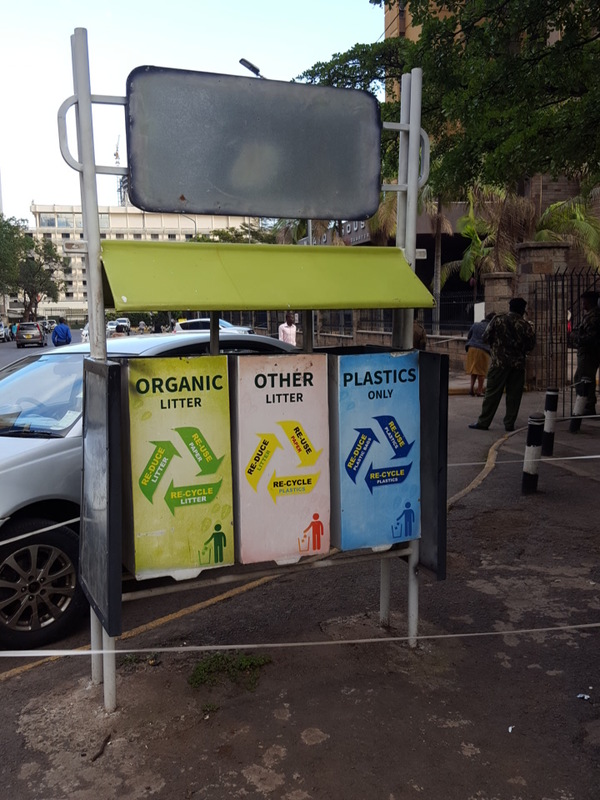 Although no nation is ever perfect, I noticed that, unlike Ghana, garbage bins were everywhere, including bins that separated recycling. 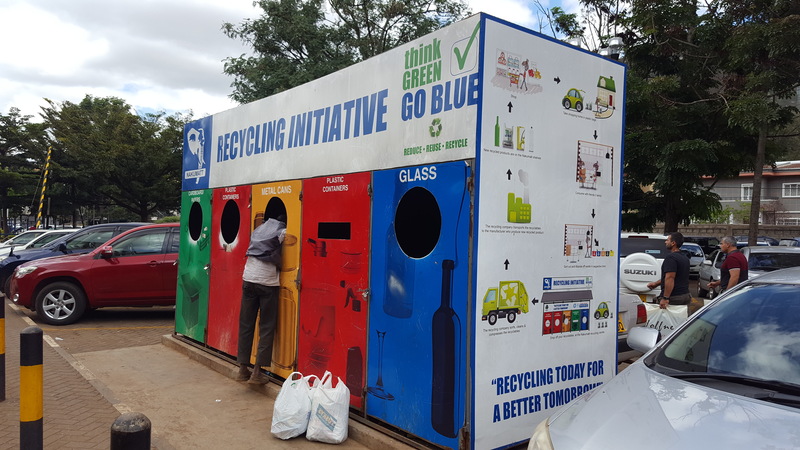 There was also the option to choose recycling which, from what I saw is a habit that many people in Nairobi seem to have adopted. When many westerners or Europeans think of Africa they often associate it with wild safaris and animals roaming freely. The reality is not every country in the continent has a diverse array of animals. However, Kenya is one of those places with a rich population of wildlife people love to see. I didn’t get the chance to do the excursion to one of the bigger safaris which are major tourist attractions four hours outside Nairobi. Instead I opted for the one just outside the city, Nairobi National Park. I would recommend it to anyone who is on a short visit and can’t make it to one of the more popular attractions. 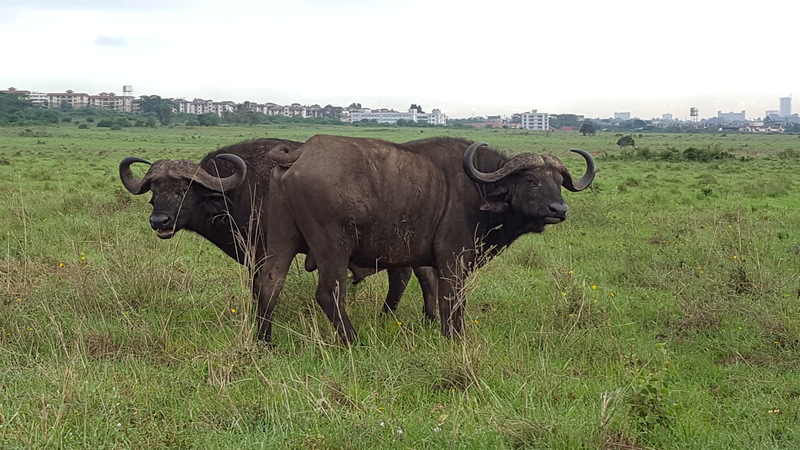 Just 20-30 minutes drive out of the city, Nairobi National Park offers a chance to see a diverse array of animals including hyenas, buffaloes, zebras, black rhinos, leopards, lions, cheetas and over 400other species. Unfortunately I didn’t get to see most of the animals they have listed as residing on the grounds. There is also an elephant orphanage that is only open during specific times. I missed out on it because my driver got lost whenwe were trying to leave the grounds. Once you finish you can also drive just 10 minutes away to the Giraffe Centre. The main attraction there is the chance to get up close with giraffes and feed them. The centre opened as a sanctuary for breeding giraffes and educate people about giraffes. I love giraffes because they’re tall and look so graceful like fashion models strutting their own runway. 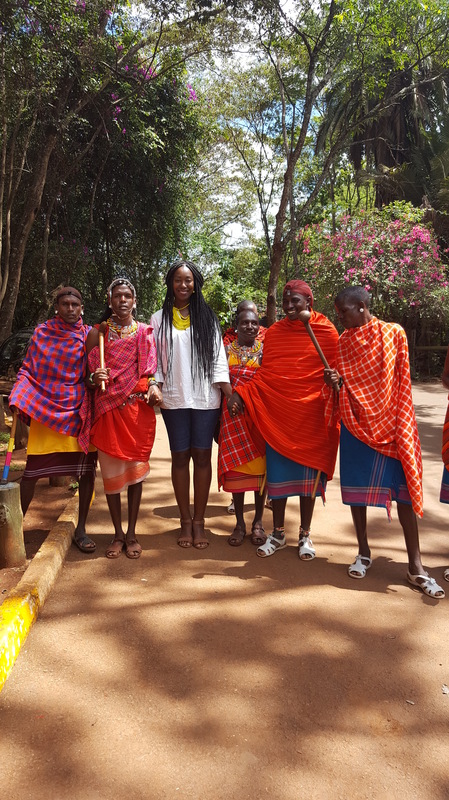 The Maasai tribe are perhaps one of the most well known from the continent of Africa. 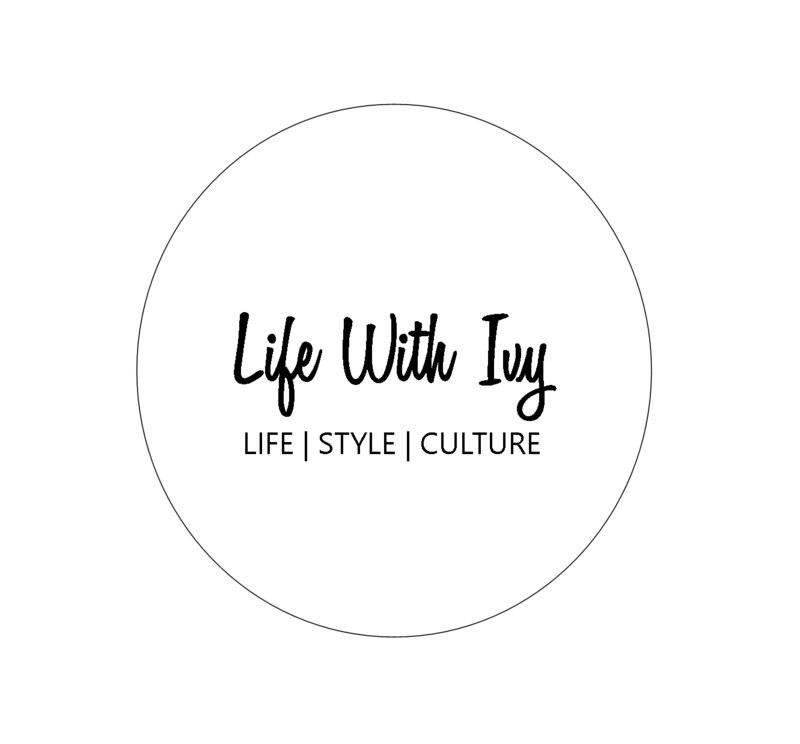 Known for the way they carry themselves with a sense of pride, their dancing and beautifully crafted beaded jewellery. They are usually draped in a woven fabric traditionally in bold patterned colours where red is usually dominant. They are truly more than meets the eye. The Maasai are deeply rooted in their land and take pride in their livelihood, which is usually herding goats and cows. Although modern urbanites may be dismissive of them, they have great value when it comes to providing resources to the urban centres. Their cattle provides meat and dairy to the masses. They create beautiful beaded jewellery that many love to wear. I learned through spending time talking to them that they have experienced challenges over the last few years because of changes to the climate, which has made farming difficult. I can only hope that there are measured being taken by the government to address the difficulties being faced not only by the Maasai, but many farmers and herders in the country. 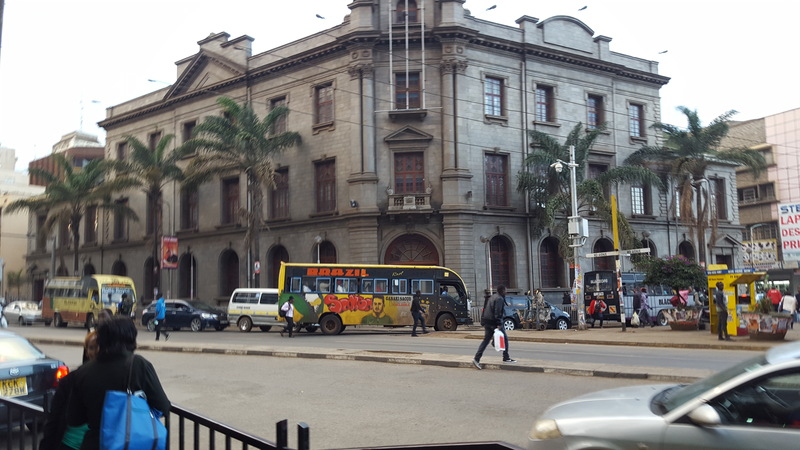 Nairobi left me wanting to know more about this Eastern African nation. Although I was there over two weeks, My time was limited due to a heavy work schedule. 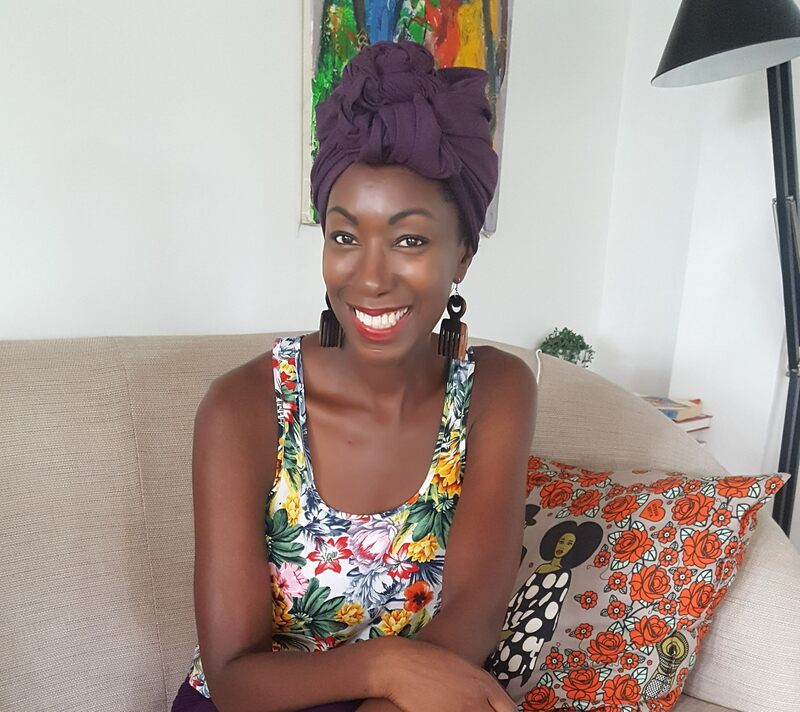 I look forward to planninga trip there for my own leisure to really dig deep and get to know more about this amazing African city.